I have a few videos that were recorded with an iPad. When I play the videos on my Windows 10 PC, everything is good. When I add them to Wirecast, they appear upside down. Researching this, it appears that there is an issue with the Codec. I converted the files from .MOV to .MP4. When I play them in VLC, everything is good. I added the .MP4 video to Wirecast and they are still upside down. Thoughts? You may want to make a Feature Request that we recognize the flag. Thank you for your assistance. I might be looking in the wrong place, but is that a 'premium' feature? Due to budgetary constraints, my elementary school uses the free version for morning announcements. I looked for the shot layer and they are all labeled STU. Are there any other suggestions you can make, short of re-filming these 4 videos? Wirecast Studio which is our standard version. They're not in the free/$10 Wirecast Play. 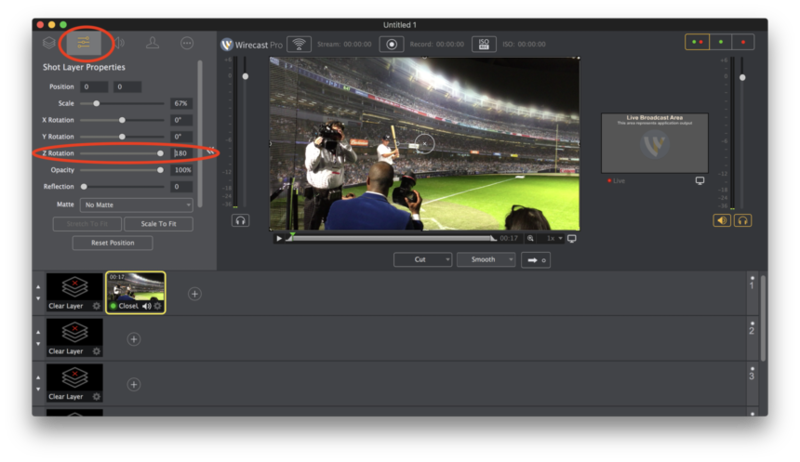 Cooperjb If you're using the free or $10 version of Wirecast Play those shot editing features don't exist. Sorry. On Mac? Perhaps try re-encoding them Right Click on the clip on your desktop and select Services > Encode Selected Video Files. You can try rotating them in iMovie as well and then exporting them. Otherwise there may be a Windows program that can rotate and export.